Council’s Planning Committee will decide Tuesday on an application from Losani Homes to build two four-storey buildings in Binbrook at 3100 – 3140 Regional Road 56 in Binbrook. City staff are recommending approval, Ward 11 City Councillor Brenda Johnson is publicly opposed to the development, stating she opposes any height greater than three storeys in Binbrook. 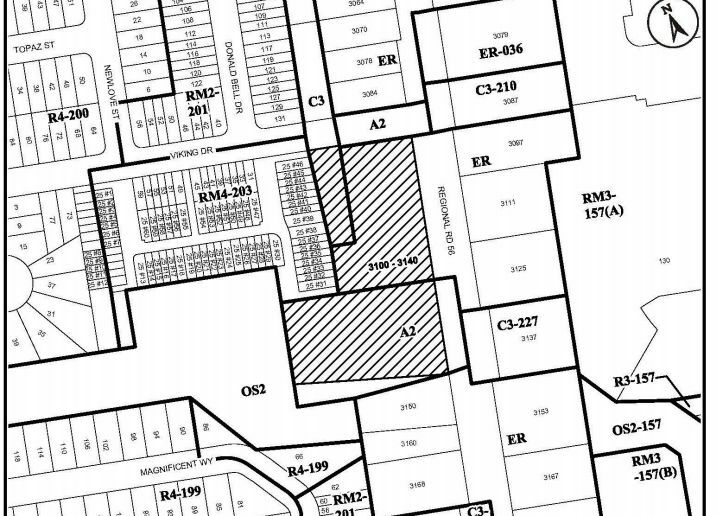 The existing Official Plan for Binbrook limits height to three storeys. “I have heard from my constituents who have expressed opposition in the past and even some Warplane pilots who use the Village as a landmark as they have no electronics to aid their flight and more than 3 storey is risky for air safety”, Johnson wrote in an email to planning staff. “I will not support anything over 3 storeys”, she closed. The two proposed buildings will house a combined total of 90 units with 1650 square feet of ground floor commercial. The land is presently three separate single home properties. The City’s Transportation Demand Management section states they want the developer to include 40 long-term bicycle storage spaces, and 20 short-term bicycle spots. Staff are requesting Council impose a holding provision on the development until the upgrade of the Binbrook sanitary sewer pump station is complete.